I knew I only had a bit of time. I told my wife to call me when my daughter needed to be picked up and out the door I went. I ran the loop around my home and got in 1.66 miles in 19:57 before the call came. That puts me up to 14.76 miles for the week with two days left. I'm starting to feel my knee stiffen up between runs. Hopefully, it won't become a major issue. This morning I weighed in at 222.5. I believe that is my low since I started running. Another 5 miler to Desert Breeze lake and back. When I get to the lake I really run the loop around the baseball diamonds. tonight there was a little league team working on one and a girls softball team on the other. I'm sure they were watching the old man running on the asphalt and wondering why. The trail has two long sides where I would run hard and two short sides that I would walk on. It is about a half mile total and I did 4 loopes around. Then I ran back home. My time was 1 hour, 2 minutes and 33 seconds. A good workout. Ran tonight. 5 miles in a little over 1 hour. The lower mileage has taken a bit of a toll on me and I've been fighting to get back to where I was at the end of last year. Tonight I felt much better and ran for longer times. I'm still taking more walk breaks than I used to, but that will change. I mixed in some tempo runs tonight. I would run about 100 yards at a 7 or 8 minute pace (I'm guessing) and then would walk. It felt good to run at a faster pace. That makes two runs in two days. Hopefully, my knee won't bother me when I wake up. I've been scanning my baseball cards. I haven't looked at them in ages. It's kind of nice to relive my youth. 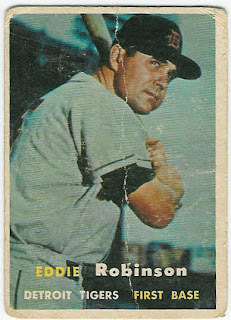 This is my oldest card, from the 1957 season. It's not in great shape, but it's the only one I have from that year. Between my knee hurtin' and low mileage I've been putting off running in any races. But, some deals are too good to pass on. The Arizona Road Racers have a series of 5 races during the summer in parks throughout the metro area. For $20 you get to run in all 5 races. Yeah, $20. You have to be a member, so I joined for $20. That's $8 a race. I'm running in 4 of them, so it's $10 a race for me. T-shirts are extra and I'll probably buy one of them. I needed to run in a race. It was well organized and had a lot of runners. 494 to be exact. It was chip timed and was held at Papago Park near the zoo. I knew I was going to set any PR's, but it sure felt good to be out there in the middle of the pack. This race had a staggered start. The older you are, the earlier you get to start. I started 12 minutes after the gun sounded and within minutes I was getting passed by all these younger runners. They had it rough because they had to weave in and out between us slower and older runners. I don't know what the hurry was about, but some of them were flying. I ran steady, but since I'm not in top form (for me) I ended up taking walk breaks. I forgot to start my Nike + and realized it about 1/4 of a mile into the race. It still helped me with my pacing. In the end I ran a 38:05 race. I could have run it a tad faster, but in the last half of the race I met up with a friend from Team In Training, Roland. We ran it in together at a leisurly pace. He started later than me and had a better time than me, but I was glad to run with him over the last 1.5 miles or so. After the race, ARR had bagels and cream cheese, cookies, chips, water melon and sodas. The line was long and we ended up waiting 15-20 minutes to get something to eat. It was the cream cheese that slowed the line down. I offered to walk down the line with the water melon so that runners could get something right away, but the water melon cutting lady thought I was crazy. I guess she thought people should have to wait in line and suffer. I wasn't going to argue with a knife carrying lady. I never tasted water melon so good. The next race is June 16th at the Reach 11 Horse Lover's Park. Anyone in Arizona, I highly recommend ARR races. I believe, Phil is very active with ARR. A Good nite for a Run! I'm having a tough time finding time to run, work, spend time with family, watch baseball and play softball. With the temps rising, I am trying to run at night, but all kinds of things get in the way at night. I'm not real big on getting up in the morning to run, but that may be the solution. The Suns are done, so I don't have to worry about scheduling Suns games into my day. The Reds are playing horrible, so I am now watching other teams play. I really like watching the Arizona Diamondbacks and New York Yankees. It would be a good year for a rematch in the World Series for those two teams. My daughter just graduated from 8th grade and is now a high schooler. My son will be a junior and we'll have to start visiting colleges next school year. I'm working a lot lately. That's good, because I'm a Realtor. No work and no money. So work is good. I have two clients that are moving to Glendale and El Mirage, which are on the other side of the world (metro area). 38 miles one way from my home. Tonight, I ran 5 miles. I ran from my home to Desert Breeze Park. There's a path that goes around the lake and two baseball fields. I ran around the path a couple times and then ran back home. It's a nice run. I ran after nite fall, so it was cooler. Probably under 90 degrees. My mileage has been low lately, but I hope to get it back up. I did sign up for the Summer Series of Races put on by the Arizona Road Runners. The first race is this Sunday in Papago Park. I need to get more miles in and pick a half marathon to run this fall. Wish me luck. I have my replacement. 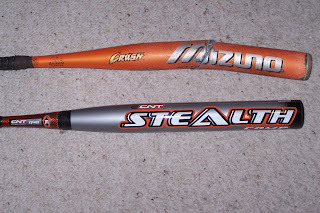 An Easton Stealth softball bat. 34 inches long, 26 ounces. Several people mentioned that I must have really swung hard. The truth is - My orange crush was used for over 3 years for 24-62 plus games a year and used by several people on my various teams. I, also, used it in batting cages which have those harder plastic balls. In softball bat years it was over 30 years old. Let's hope my new stealth last that long. Friday was opening nite of the summer softball season. I went to the cages the night before to get some hitting practice in and take a short run. While I was at the cage I broke my bat. 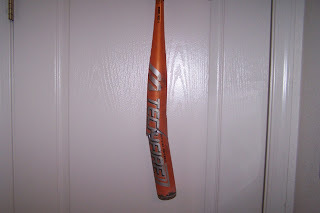 Not a wooden bat, but my Mizuno Orange Crush. 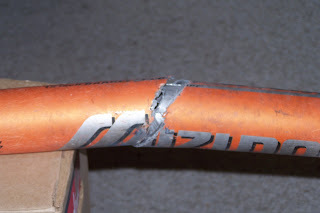 It's $200 to replace. We had to play without it on Friday nite. After four ininngs we were leading 7-0 and I had hopes of getting a shutout. My first one ever as a softball pitcher. But, then the wheels came off and we gave up 6 runs in the last two ininngs and barely held on for the win. Below are pictures of my bat. Rest in Peace. I got four runs in this week. Not real high mileage (11.84 miles), but I suited up and went out four times. Lately, work, watching sports and life have gotten in the way. I'm gonna change that. Tonight I decided to get in a 5k. I ran 5 miles last night and I wanted to do a back to back. I wanted to run a bit faster too. I have been in a rut as far as my time is concerned. So tonight in the dark I started to run. My legs have felt great the last couple weeks. No knee issues either. I don't know why but I starter thinking about my high school wrestling days. In wrestling you have to get mad, hate your opponent and want to crush him. I always had problems with that back then because I was too nice. I still like to think that I'm too nice to this day. But tonight as I ran, I thought about wrestling and some of my old teammates which lead me to day dream about wrestling and as I did I was getting an attitude. A mean attitude and I was running just a bit faster. In the end I ran the 3.1 miles in 35:04 for a pace of 11:19. I had been running at a 12 something pace, so I was happy with this. I need to get my 5k pace down near 10 minutes. 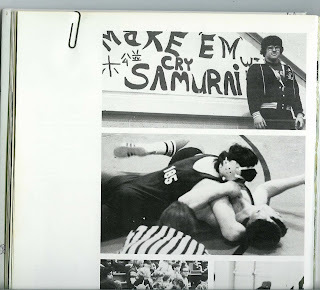 So, here's some wrestling pictures from my high school yearbook. Aiken High School, Cincinnati Ohio. Class of 1980. The top picture is me in front of another wrestler's sign. I'm half japanese, so we felt the sign should have been for me. This was at the league tournament at Western Hills HS in 1980. The picture below is a rare shot of me with the advantage. Both shoulders have to be touching. I guess one isn't. You can see the number 185 on my back. That's my weight class. Sure would be nice to be under 185 now. and I'm staying home. Good luck to those that are running the Flying Pig in Cincinnati and the Whiskey Row in Presscott, AZ. Someday, I'll do both of those races. But, not this year. Three half's in the first three months of the year was quite enough. This week I ran on Tuesday night. I could see the lighting going on over the reservation to the south of Chandler and I thought I could get a run in. I made it .67 miles before the drops started falling. I considered continueing. I've run in the rain before, but the lightening was getting closer and closer. So, I packed it in and called it a day. My time was a blistering 7 minutes and 26 seconds for a 10:59 pace. I wasn't panting and I don't think I even sweated a bit. Last June I would have been wasted by such a long run. Now, it's nothing. On Wednesday I ran 3.07 miles in 37:26 seconds for a 12:09 pace. It seems like my first mile has been 11:21 for the past 3-4 times I've run. Is my nike+ out of whack? I'm going to have to compare it with my heart rate monitor to be sure. Softball is starting on may 11th. I'm excited. The Suns beat the Lakers in the first round of the playoffs. I'm pumped. The Reds? Oh well, they're in second place. Some days are better than others for them. I just finished reading in the Cincinnati paper that my brother is sueing a comedy club and Chad Johnson of the Bengals. Turns out my nephew won a trip to the super bowl that Chad was supposed to pay for. He never fulfilled that obligation. Then he was going to give away a Lexus at the comedy club. So, my brother bought a bunch of tickets to that show. He gave the car away to his girlfriend instead. Insteresting stuff.